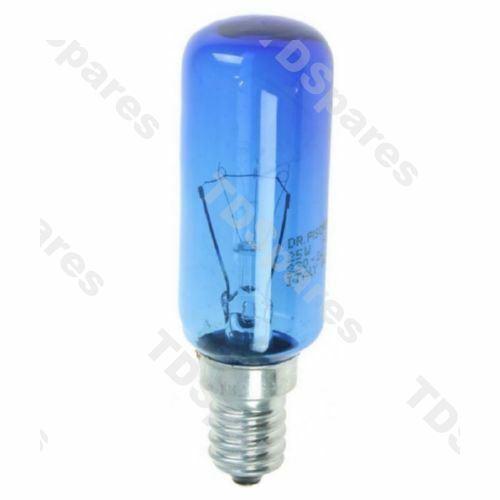 If your fridge freezer has a blown light bulb, then why not replace it with this brand new 25W lamp, it's an original spare part from Dr Fischer Lamps Germany (OEM) and will have your fridge lighting up like new again! Fits numerous models of side by side fridge freezer and built in fridges from Balay, Bosch, Neff & Siemens such as K4316X7GB, KAD62S51/01 KAD62S51, KAD62S51/06 KAD62S51, KAD62S51TI/01 KAD62S51TI, KAN62V41GB, K5920L0GB KUR15A50GB/01, KUR15A50GB/02, KUR15A50GB/03, KUR15A50GB, KUR15A50GB/04 K8524X8GB/01 KA62DS50GB plus many more. Please note that Bosch recommend changing like for like when replacing this refrigerator lamp. SPECIAL OFFER - BUY TWO FOR ONLY £14.95! Click the drop down menu in price box above to select. If you are unsure about compatibility, then please contact us and provide your full make & model number (usually found on your instruction book or behind the salad box) and we will be happy to check for you.